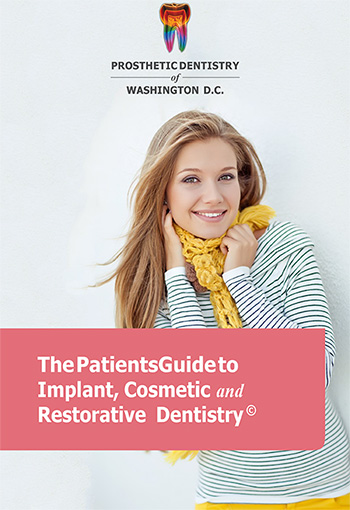 Patient Information | Prosthetic Dentistry of Washington D.C. Welcome to Prosthetic Dentistry of Washington D.C. With outstanding experience and skill in the dental arts, Dr. Gerald Marlin and our talented staff set a new standard of quality and care. Your cosmetic or general dental treatment is customized just for you and performed in a friendly and professional setting. Expect your visit be a distinct pleasure and your results to be above and beyond the ordinary. Our website is intended to be your comprehensive information resource for a better understanding of our practice, dental services and commitment to you, our valued patient. To learn more about Prosthetic Dentistry of Washington D.C. or to schedule an appointment, contact us online or at 202-244-2101 today. We’ve helped men and women from across the country and closer to home, including Washington D.C., Bethesda, Arlington, and nearby areas of Maryland and Virginia. 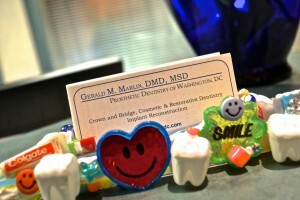 Dr. Marlin is one of the most experienced specialists in implant, cosmetic, and restorative dentistry in the Washington D.C. area. He holds both a certificate and a master’s degree in prosthodontics. Our team members are an integral part of your exceptional treatment at Prosthetic Dentistry of Washington D.C. On average, our staff members twenty years of experience in restorative dentistry, and have been with us for over fourteen years. No matter which member of our team is helping you, we are confident that you are receiving exceptional care. We are renowned for being problem solvers in all phases of restorative dentistry, and regularly receive referrals from general dentists and other dental specialists to treat their patients. As a specialty practice in Prosthodontics, we offer comprehensive dental care in all phases of implant restorations, cosmetic veneers, composite fillings, crowns, bridges and other restorations. Various studies have indicated that the average crown lasts 5-10 years. While no one can guarantee the duration of a dental crown. Our experience has been that a vast majority of our crowns have lasted over 35 years. Whether you need routine tooth cleaning or more complex dental care, our highly trained staff is dedicated to providing you with the highest level of dentistry in a caring environment. In addition to handling simple dental needs, we are often called upon to problem solve more challenging cases, such as complete smile makeovers. Should the services of another specialist be required or if we are working with your general dentist, we will assist you with the coordination of your treatment with the other practitioners. We invite you to come in for a comprehensive examination and consultation. Our approach is that good dental care is an investment in your dental health. Let us help you enjoy excellent dental health while looking younger and healthier with a beautiful smile. Most often, you will have a separate consultation appointment to review our findings, in detail, from your initial examination. During the consultation, we will review your existing condition and present the available alternative treatment plans along with the rationale for each one. With the aid of digital images, we will demonstrate how new dental technologies may benefit you in your choices of treatment. Consultations are scheduled at the end of the day to allow sufficient time to address all of your questions and concerns. As a prosthodontist, Dr. Marlin works with other specialists and/or general dentists when providing treatment. While many of our patients are referred to us by other practitioners, others are referred by family or friends. A professional referral is not required to schedule an appointment with our office. You deserve the highest quality of individualized attention and dental care. To learn more about the PDWDC difference, call us today at 202-244-2101. We welcome patients from Washington D.C., Bethesda, Arlington, nearby areas of Maryland and Virginia, and across the nation.